The NBA playoffs expose a team weaknesses. Terry Rozier's play cannot be labeled a weakness, but he is young and he is only 6'2" tall. The Cavaliers are making a habit of setting screens that will force the smaller Rozier to cover Lebron, and in many cases it appeared the Celtics were too willing to let it happen. The same dilemma also occurred, but less frequently, with Tristan Thompson being defended by T-Ro. Cleveland is feasting on that strategy. Marcus Smart has not been effective offensively against Cleveland, and having him start the game defending The King may be a tactic that Brad Stevens will consider. 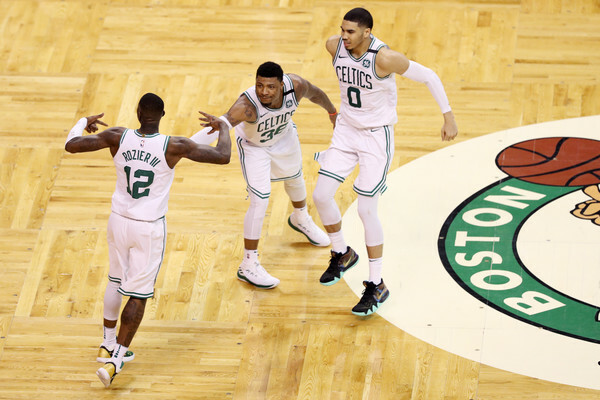 A 6'4"/6'7" backcourt of Smart and Jaylen Brown will not suffer nearly as much from mismatches, and Marcus has the passing skills to get his teammates untracked early without the miscues that plagued the team last game. James and Thompson will not be able to take advantage of Marcus as they did with Terry. Celtics don't win this series without Tatum and Brown playing high-level ball at home. If you want a lineup change in Game 5, I'd swap Smart in for Rozier. Set an early tone, let Terry come in with a green light. Marcus Smart said he asked to guard LeBron down the stretch: "Our job was to make it as hard as possible for him. I felt like I could do that. You saw that he didn't want to bring the ball up against me, to save energy, which we expected." Game Five is at TD Garden tomorrow night. Boston showed real grit coming back from an early 19-point deficit and cutting the lead to nine points to end the game. I believe that toughness will carry over into Wednesday's contest, and I believe that Marcus Smart can supply the needed spark to help get the Celtics their third win of the series.